Purepower’s turbo platform spans across new high-volume makes and models delivering power, reliability and efficiency for a multitude of light-duty diesel engines and are verified to meet OE specifications. 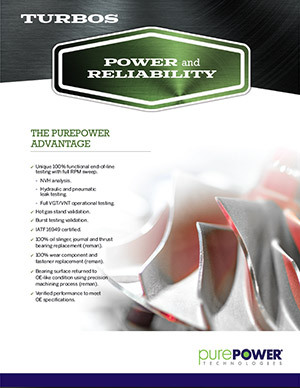 PurePower turbochargers offer a quality unmatched by our competitors. To learn more about our assortment of all makes wastegate and variable geometry turbos, view our product catalog.